Ratatouille is stewed vegetable dish, with the main ingredients being tomato, zucchini, eggplant, and peppers, mixed with Mediterranean herbs, and stewed in olive oil. Although a thick gravy is present, ratatouille is not a soup. The word ratatouille is pronounced rat-a-tooey and is a French word, but the full name of ratatouille is ratatouille niçoise referring to the Nice region of France where ratatouille is most often associated with. Food historians differ on the exact origins of ratatouille, was the dish French, perhaps Catalonian, or could it have been a Basque dish that made its way into the kitchens of Southern France, Northern Spain, and the Balearic islands. Could the dish be pre-Roman peoples, although if this was the case then it would have most certainly been made with other ingredients since tomatoes and zucchini were only introduced to Europe from the Americas whilst eggplant is native to India, none of which were known in Europe until at least the 1600s and possibly later. In fact, Basque people have been making a stew with potatoes and mutton since before written records in Roman times. The basques landscape is rugged, with plenty of hills and mountains, completely unsuitable for growing extensive fields of crops so sheep farming, fishing, and growing potatoes were the main industry. The basque stew of potato and mutton would be thickened with stale bread and seasoned with salt or whatever herbs grew locally. The modern ratatouille dish is claimed by the people of Nice and the Provence region of France, located in the South East bordering Italy who are known for a cosmopolitan culinary style that is at once typically Mediterranean, yet also quite French, so it isn’t hard to imagine Nice being the home of ratatouille. 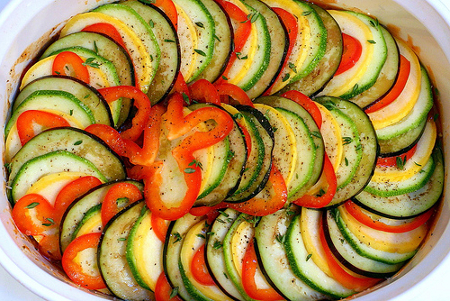 Throughout the Mediterranean, any dish made with vegetables and stewed in olive oil will be given the name ratatouille even if the resulting dish isn’t true to the traditional recipe, so it fair to say that ratatouille is more of a style of preparing a vegetable stew than a particular recipe. Politically, the provence region and most of the French south coast along with the north western coast of Italy and the north eastern coast of Spain have always been close, and from 1720 till 1860 Nice was part of the Kingdom of Savoy which also included Savoy in France, and Sardinia, Piedmont and Liguria in present day Italy. It was during this time that some local historians believe the ratatouille dish was first created, and then quickly spread to other parts of the kingdom. Modern interpretation suggests in fact that ratatouille may have only inherited its name from Nice owing to a particular recipe that became popular, and that ratatouille was in fact first created elsewhere in the Kingdom of Savoy. A definitive cookbook published in the late 1900s, La cuisiniére Provençale by J. B. Reboul which provides an exhaustive list over 1100 traditional Provencal dishes, and significantly, ratatouille is not listed. The Catalans of Northern Spain, whose capital city Barcelona has been in important trading city and center of power for hundreds of years claim that people from Southern France adopted their samfaina recipe which is strikingly similar to ratatouille and is often prepared with fish pieces. Both ratatouille and samfaina are usually served with bread for dipping in the sauce left in the bowl after the larger vegetable chunks have been eaten. 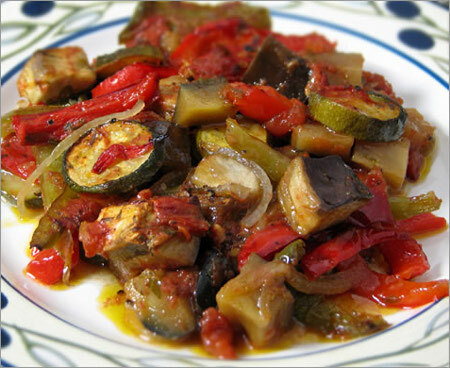 In Malta, another of the Mediterranean countries, a dish known as Kapunata, and also made with eggplant, garlic, and tomato is a local favorite, adding fuel to speculation that ratatouille as a dish is prepared throughout the Mediterranean. Whilst ratatouille, or local variants are made throughout the Mediterranean, a true ratatouille from Provence will be made with just eggplant, zucchini, tomatoes, peppers, and onions, then simmered in olive oil, and seasoned with herbes de provence, a particular mixture of herbs that grew traditionally in the region, these being rosemary, oregano, basil, thyme, serpolet, and savory. Chefs from the Provence region of France will scoff at any other recipe claiming the name ratatouille niçoise if any other combination of vegetables or herbs are used. During the 20th century ratatouille has spread with French cuisine to almost every corner of the globe and the word has entered the English language. Ratatouille, traditionally peasant food, or at least made from cheap and possibly over ripe ingredients, is now a culinary dish served in the top restaurants and many top chefs have their own special recipe that regularly receive acclaim from critics. In 2007, Disney Pixar produced an animated film based on the story of a rat who loved nothing better than to cook up a storm in the kitchen. The title of the film was a play on the lead character being a rat, and went onto win best Best Animated Feature Film in the 2008 Academy Awards, and a Golden Globe as well. The success of the film encouraged many family oriented restaurants to offer ratatouille as a menu item for children, although historians doubt the dish’s new found popularity will prove sustainable.